Many of you will know that the Transition Network has unleashed the beast, opened Pandora’s box and embarked on an economics adventure. This session will introduce you to this adventure and the REconomy Project, which was set up in late 2010 and has been quietly gathering pace. If you want a practical hands on introduction then you should be at the REconomy Day on the 14th of September. But if you want an emotions-connecting, thought provoking exploration of the emergent new economy, then this is your session. Rooted in real examples we want to map out an upsurge in seemingly small economic trends and isolated enterprises that collectively hold the key to the ever elusive systemic change. These trends and enterprises are the tip of an interconnected icebergs, which feed into a well established, long standing, evolutionary systems, that has had a fossil fuelled blip but is unwavering in it’s longer term direction. We also want to identify some oncoming tipping points and thresholds that may be closer than we imagine and that when crossed awaken positive systemic changes that become unstoppable. The prevalent stories of humanity and progress fail and crumble around us and as such we’ve become fluent, almost eloquent in defining their socio-ecologically destructive causes. In a natural state of reflection the new stories, and crucially, the new emergent global realities, stir and awaken from their fertile beds……. Shifting our collective focus, we become rapidly and increasingly fluent in articulating credible alternatives to the current individualistic consumerism based progress-juggernaut that we’ve boarded. This infectious understanding that another world is possible leads to a physiological shift, a new collective belief, which in turn seeds the global systemic change. 5, maybe 3, or even as recent as the last year, we lacked the ability to articulate a credible alternative to our self destructive economic system. A new and positive vision of the future had little or no chance of going viral because we couldn’t root it in practical working examples active in the present. I [Shane] know, i learned the hard way in 2003/4, through a failed project called “visions of another world” but had loads of fun in the trying. But that has changed in the last 10 years under the surface there has been incredible entrepreneurial undertakings on a scale that we individuals cannot, at this point, fully capture. I love this thought but the problem for most of us is that we really can’t see this happening in our local communities. There might be a community bakery doing outstanding work but this tends to be very isolated and a million miles away from the rather glamorous notion of being world changing. Over the last 18 month my work with the Transition Network’s REconomy Project has forced me to embed myself in the world of disparate enterprises and spread out innovations and economic disrupters of the most subtle and unassuming kind. These trailblazers and pioneers who are delivering ground up change don’t set out to change the world, they’re just filling a gap or making a difference at a community level. But in doing so they give, our new stories of humanity and progress, roots in reality, which is coupled with the changing actions of millions and the pent up demand of billions of people. These emergent trends have tipping points and it’s important for us to understand these tipping points. It is easy for us to understand and even visualise the negative destructive sleeping giants that are ready to reek havoc when we cross, for example, temperature thresholds. We get the fact that when the Amazon burns or the Arctic and permafrosts melt they’ll kick off unstoppable climate destructive feedback loops. We understand that all these environmental problems are rooted in disfunction socio-economic systems but we need to know that these are changing and have equally important thresholds that are actually closer than we may think. 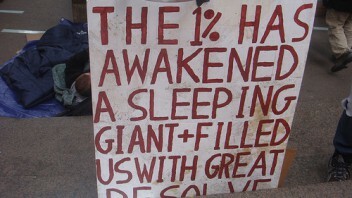 We’re clearly in a kind of race, will we awaken the negative or positive sleeping giants first??? For sure it won’t be that clear cut and it’s my belief that the reality will be a mix of the intensely positive and negative and that our future will hang in the balance and that the hero that can lead us through the treachery and the danger will be our collective ability to imagine that there is an amazing world just around the corner…. but we will never be able to image, believe or have that deeper experiential knowing, that a positive future is possible, if we don’t have real live tangible examples to imagine scaled up and to root our dreams in.